The Jeep Wrangler Call of Duty: Black Ops Edition hits dealerships next month for a suggested retail price of $30,625 and $33,500. But why does it even exist? For Chrysler slapping the upcoming first-person shooter's logo on their Jeep and adding new taillamp guards and a fuel-filler door was well worth a chance to team up with a popular and well known video game. "The Jeep brand's partnership with Activision marries the world's most capable and iconic vehicle – the Jeep Wrangler – with one of the world's most popular entertainment experiences," Mike Manley, President and CEO – Jeep Brand, Chrysler Group LLC., wrote in a press release. "As a result, we are able to expose the Jeep brand and its legendary capability to an entirely new group of consumers." And Activision Chief Marketing Officer Brad Jakeman sees this as win-win as well. "This is a dynamic and fully integrated partnership that brings together two iconic brands across a full array of consumer touch-points," Jakeman said. "From the beginning our teams worked together to make this a truly creative partnership that added to the consumer experience of both the Jeep and Call of Duty: Black Ops brands." Treyarch points out that the deal means that the Jeep Wrangler shows up in the game as well. "It was important for us to make sure that the Jeep partnership would be authentic and enhance the setting we immerse our fans in with Black Ops," said Mark Lamia, Studio Head of game developer Treyarch. "Our work with the Jeep team focused around using the Jeep Wrangler in our levels, and gameplay experiences, and translating the style and look of the vehicle in Black Ops to the Jeep on the showroom floor that our fans can own." 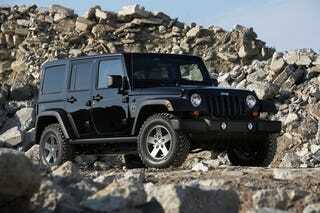 The 2011 Jeep Wrangler and Wrangler Unlimited Call of Duty: Black Ops Edition is based on the Jeep Wrangler Rubicon model. It only comes in black and features Call of Duty: Black Ops graphics on the roof and front quarter panels. The vehicle also includes taillamp guards and a fuel-filler door from Mopar. This isn't the sort of thing I could ever imagine myself buying into. No matter how much I'm into the fiction of a video game, movie or book, I don't think slapping it's logo onto a vehicle would make me want to buy it. But it doesn't seem like it does anything to the game and I'm sure there are people out there who would stand in line to spend money on a vehicle tied to a game they love.